Tag Archive | "Emissions training"
With talk in the news of dirty air affecting public health means it’s down to the independent sector to have the tools and technical know- how to service these parts or risk losing business to other garage networks and franchise dealers. But where can they go to learn about the latest systems? Julian Goulding, UK Marketing Manager at Delphi, says that technicians can benefit from enrolling onto the firm’s ‘Understanding Emissions’ course, that focuses on helping workshops diagnose and fix petrol faults without hassle. “Delphi’s ‘Understanding Emissions’ covers diagnosing petrol faults using the exhaust emissions data, looking at gases coming out of petrol vehicles and related ECU controls”, said Goulding. “It’s a one day course and the aim is to be able to accurately diagnose engine management faults”, adding that the firm also runs a ‘Diesel Emissions Exhaust After Treatment’ programme, allowing garages to repair EGR valves, DPFs and AdBlue systems effectively. 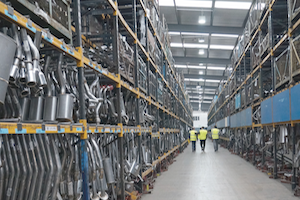 Similarly, exhausts manufacturer Klarius Products has run its IMI accredited scheme for over a year, with further plans to launch a second level instalment later this year. Doug Bentley, Head of Research and Development at the firm, explains more. “The Emissions Control Training is a scheme aimed at technicians operating in independent garages. The course is modular and runs over two days; covering new technology, best practice, legislation and failure modes regarding exhausts, catalytic converters, DPFs and additive systems”. He adds. “The course is held in various locations around the country with four modules offered in level one”. Although it seems imperative to train-up staff, Mark Blinston, Commercial Director at BM Catalysts, mentions that a large proportion of garages are still misdiagnosing DPFs, usually ending up with the clogged filter returning to the workshop or sent off for regeneration. “The issues garages are typically facing is a lack of understanding and awareness for the DPF to go faulty in the first place”, said Blinston. “One problem factor we hear of is that a DPF comes to the end of its life cycle but the technician forgets to reset the ash counter on the ECU during replacement. The car then thinks it’s still full of ash and before you know it, a warning light appears on the dashboard”. Delphi’s Julian Goulding agrees. He said. “The main issue is the correct diagnosis of what has caused the issue on the DPF to fail”. manufacturer’s parts contain a 409L (low carbon) steel grade providing added corrosion protection and durability while complying to industry standards. “All of our catalytic converters metal work elements are formed from stainless steel” said Newby. “The 409L steel grade features a specific amount of nickel and chromium on the substrate with high temperature corrosion resistance characteristics. Our exhausts, flanges and hooks are typically stainless steel coated with aluminum for high level corrosion resistance as well”. In the near future, petrol- powered vehicles may have filters akin to a DPF fitted as standard. VAG plans to fit the first GPF (gasoline particulate filters) on the Tiguan and Audi A5 from next month, while the Group predicts around seven million of its models will incorporate this technology by 2022. VAG also claims that the new filters contain the same properties found in modern diesels and can reduce soot particles up to 90 percent. Meanwhile, there will be many opportunities for workshops to clean or replace DPFs for some time yet, as despite the bad headlines, new diesel registrations are relatively unaffected. “As with the introduction of any new technology, significant uptake is going to take time for full EVs with a technology yet to be fully proven .” said Klarius’ Doug Bentley. EEC’s Paul Newby concurs. “We’ve seen strong growth in DPF sales and for the foreseeable future we will continue to see an increase in this area”. As the old saying goes, ‘It’s better late than never’, a slogan some garages may act on if they don’t get to grips with the new emission laws, technologies and training soon to remain competitive and in business.